Unit will be led by former director of digital strategy and partnerships Oliver Lewis. News UK has launched The Fifth, a full-service influencer marketing agency that will aim for a fresh approach to working with influencers by defining them by their tone and format, rather than scale. The agency is founded and led by managing director Oliver Lewis, previously director of digital strategy and partnerships at News UK, and will offer talent identification and management, storytelling strategy, creative production, cross-media amplification and events for both brands and influencers. Lewis will be joined by strategy and content director Jess Markwood, business directors Alex Carapiet, Rebecca Reeve-Kendall and Charlie Ross, head of talent Sarah Gillespie, creative director Vanessa Onalo and campaign director Oliver Bond. The artist: uses their craft of choice as a vehicle to portray a story and express themselves. The host: leads from the front; welcomes guests and presents to their audience. The cosmopolitan: well-connected in culture and popular society. The party doesn’t start until they walk in. The enthusiast: passionately focuses on and articulates their niche topic of interest. The expert: has heritage, pedigree and respect within a particular field of expertise. The journalist: professional writer or broadcaster for a news, magazine, online or TV company. The collective: variety of voices and personalities joined together by a shared passion, skill or ideology. The humorist: regularly tells stories using comedy. Irreverent, sketch-led, comedic by profession or format. The tastemaker: early adopter, trendsetter, brand maker. Makes judgments on products or brands and their audience follows. Lewis said: "Influencer marketing is one of the most exciting and fast-growing areas in brand communication. But the space is still in its infancy and, with any industry in rapid growth, challenges persist. Brands require more support identifying the right talent, building longer-term partnerships, authenticating their background, proving meaningful ROI and delivering authentic and diverse stories. 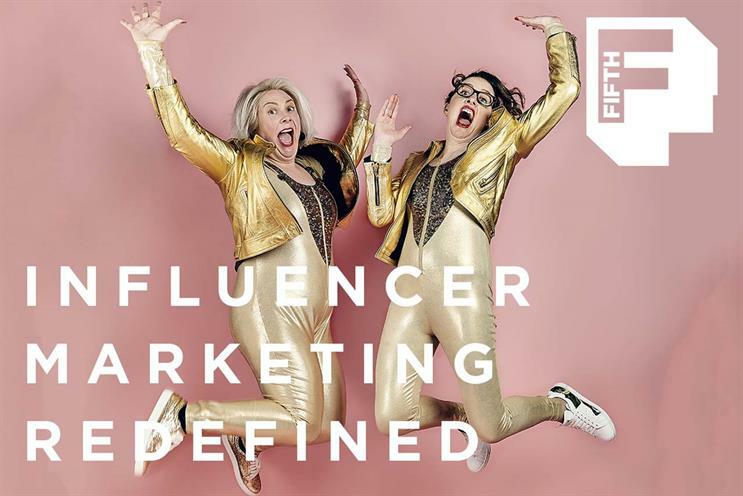 "The Fifth helps brands elevate influencer marketing into multichannel campaigns. We believe in a human-first approach to talent identification. We immerse ourselves in cultural trends and we build connections with the tribes defining them to help brands join the conversation at the right time and in the most genuine way." The agency will be powered by a partnership with Corq, an independent intelligence platform that uses journalistic insight and analysis to provide a talent selection strategy for brands. Sara McCorquodale, founder and chief executive of Corq, said: "The Fifth embodies everything Corq stands for – understanding human stories, why they are so compelling on social media and how brands can be part of this new media in a positive way. "There has to be more to this than ephemeral sponsored content, and with Oliver and his team we are excited to help brands and influencers build lasting partnerships which produce exciting work of true substance."